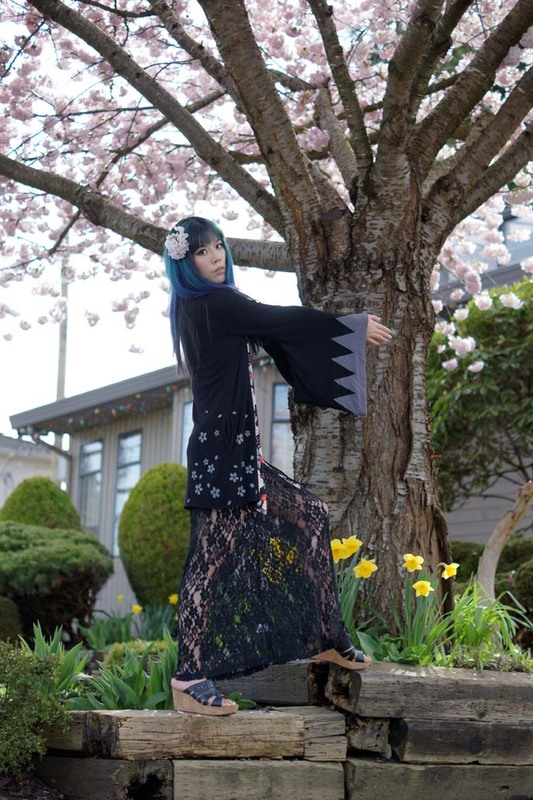 Japanese cherry blossoms outfit! 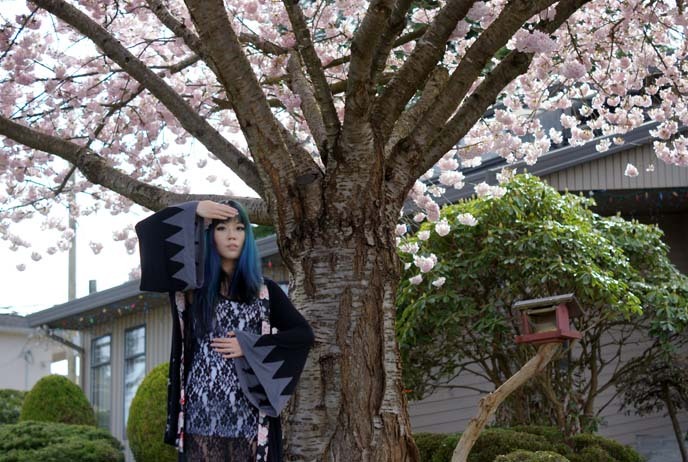 How to celebrate sakura season & hanami fashion. 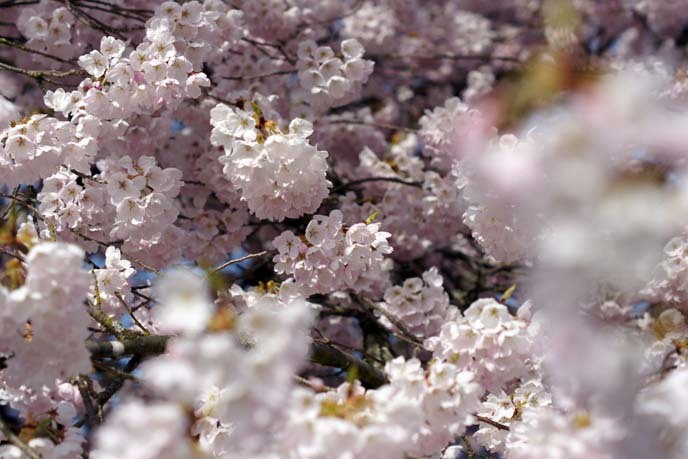 It’s a special time of the year for many people in Japan: sakura season. 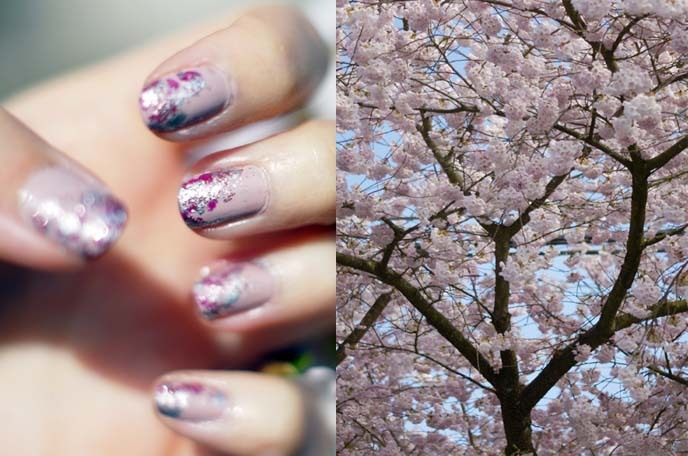 Cherry blossom trees are in full bloom, and friends are getting together to appreciate the pink petals while they last. 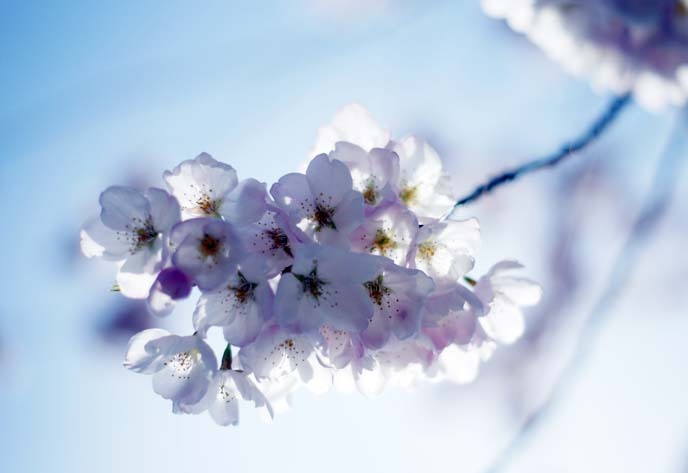 Have you heard of hanami (flower viewing), or taken part in this tradition? 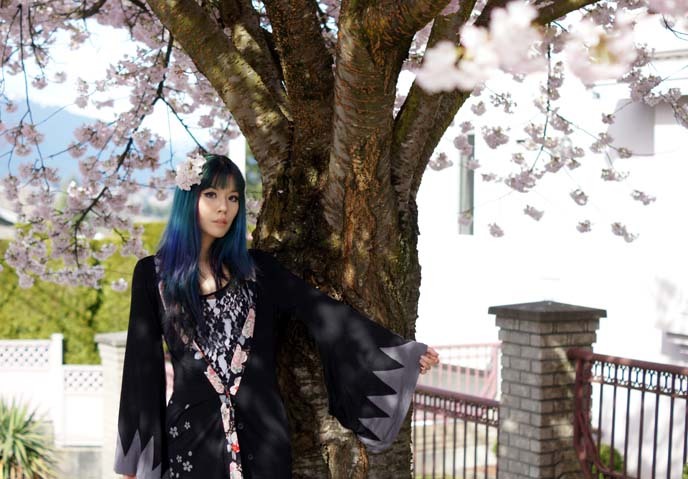 Read on for the beautiful story, and my sakura-inspired coordinate! Around late March to May, Japan turns into a cotton candy wonderland. 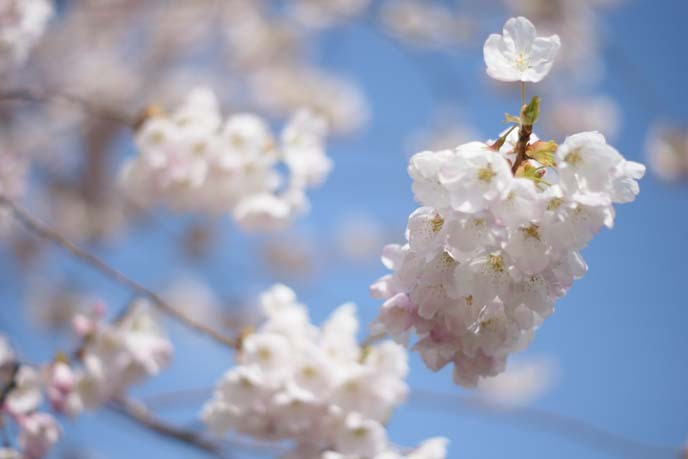 The season’s is a big deal here: as winter ends, people start to check the “sakura zensen” forecast, or cherry blossom front. 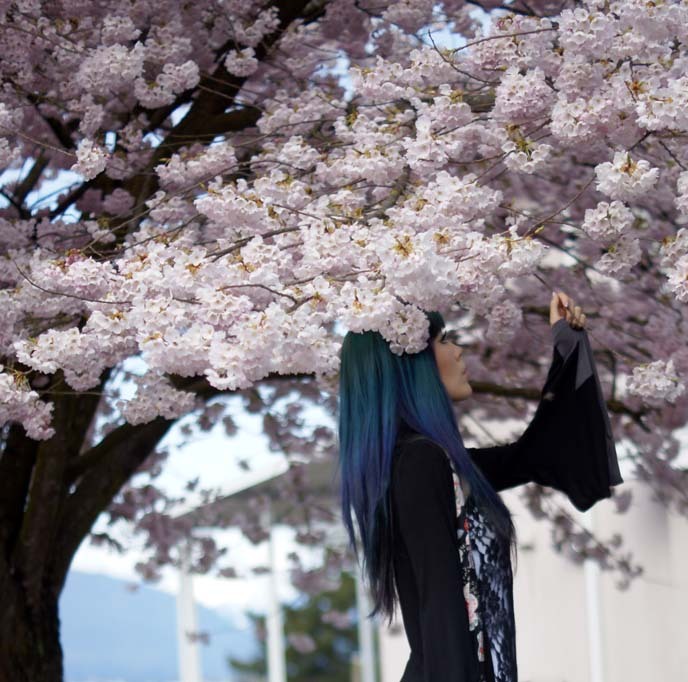 When the trees are blossoming, it’s time to celebrate. But what to wear? My long, lace maxi dress from Salsit was perfect for the occasion. I love the sheer floral print and romantic feel of the Widow dress. The flower-appreciation began centuries back, in the Nara period. 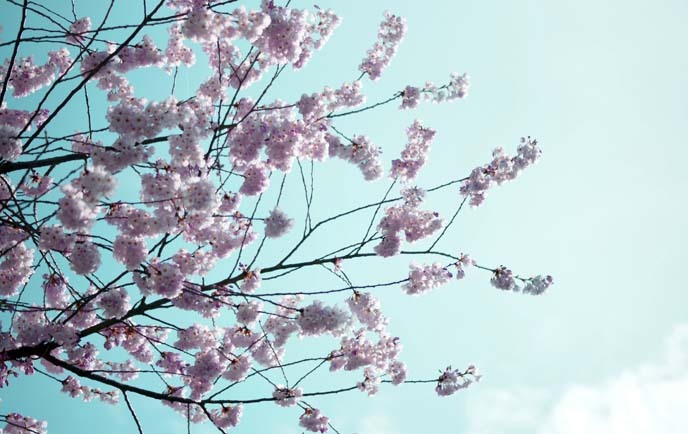 Today, the Japanese still hold “hanami” festivals or gatherings to appreciate the short-lived cherry blossoms. People of all ages and interests take part in hanami. Many have picnics in Tokyo’s Yoyogi park (tip: go early to save a space, as it fills up quickly especially on weekends). Families and friends drink, eat, take photos, and play music in this dreamy setting. I wanted to pay tribute to the season with my outfit. The Salsit dress is sheer, so I wore a long white tank-top under (to break up the length, and reveal the black lace flowers). I chose Japanese-style sandals, and pinned some cherry blossom flowers to my hair. 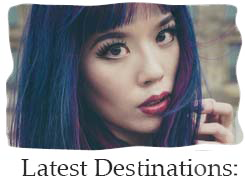 My electric blue haircolor gives my look a modern feel. But in black and white, it’s timeless. 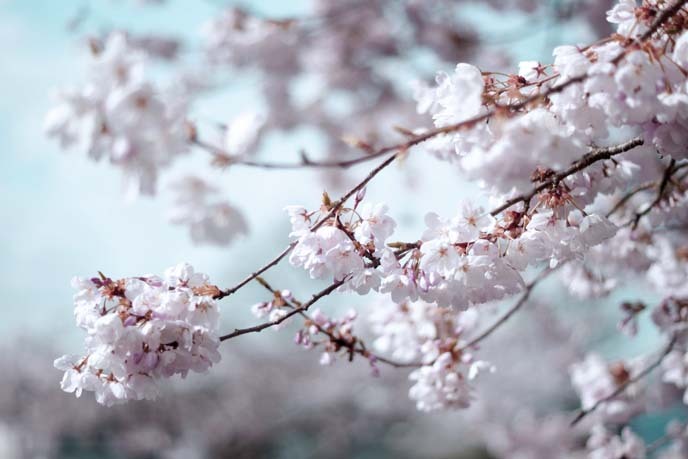 Although “prunus” trees are found around the world (including North America, Australia, South America and Europe), cherry blossoms are a distinct Japanese symbol, and have been important throughout the country’s history. Many “yukata” or summer kimonos have long sleeves and cherry flower prints, colors or motifs. 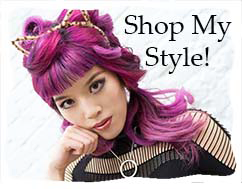 Light pink, mint, and other pastel colors inspire the spring fashions in Japan and worldwide. 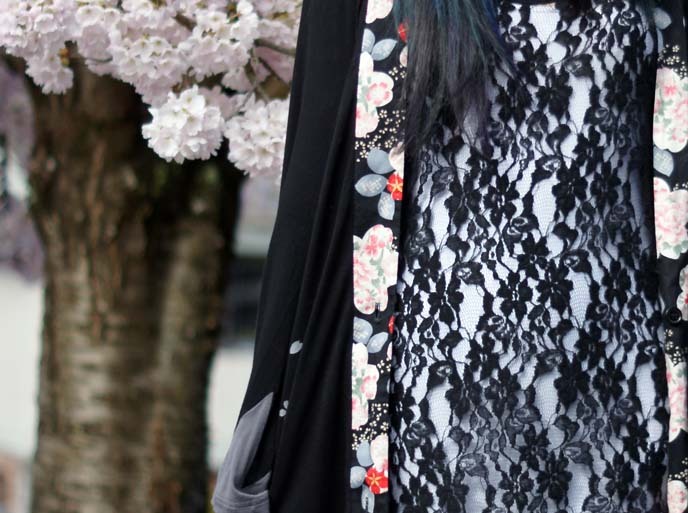 The print on the back of my kimono-top seems like an extension of the flowers on my lace dress. 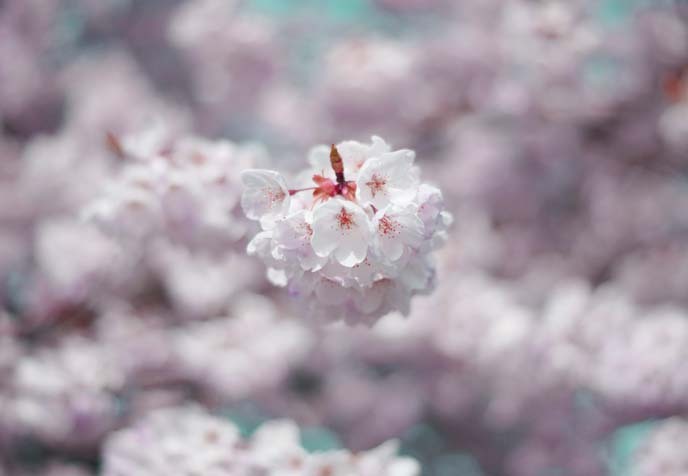 Cherry blossom viewing is also linked to a Japanese concept called “mono no aware,” or melancholy appreciation of the impermanence of things. The blossoms are beautiful now, but they will soon fall and be gone — like all things. So we might as well appreciate them to the fullest, in this present moment. Some people attend shrines or Buddhist temples, to see the flowers. 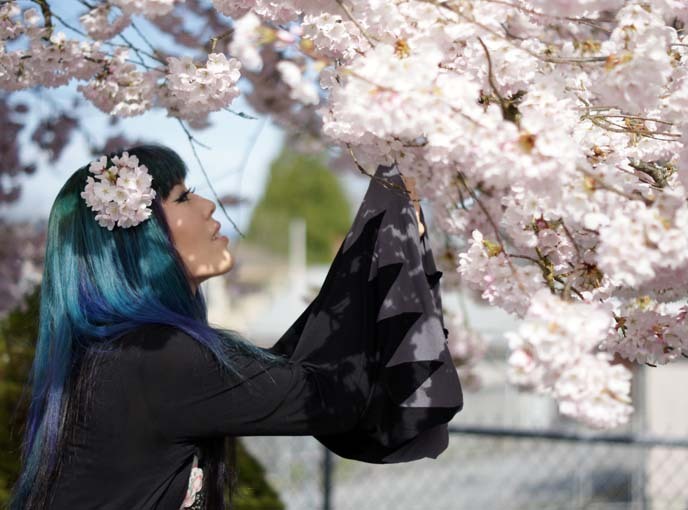 My Tokyo friends hold a yearly “Goth hanami” — it’s the same as what regular folk do, but with more piercings, tattoos and alcohol! Details, details. Dark meets light, pastel meets Gothic. I even did DIY sakura nail art to match. It’s pretty simple: start with a grey-pink base coat. Then, cover half of each nail with dots of magenta, on a diagonal. Then, add specks of silver and pink sparkle. Finish with a top coat. You don’t need to be in Japan in order to take part in the festivities. Many worldwide cities have cherry blossoms festivals, which may include traditional music and dance performances, and food vendors. … drawing, painting, or making dried pressed flowers. The Japanese use sakura as an ingredient as well. The blossoms are pickled and used in sweets like mochi, or drunk as tea. 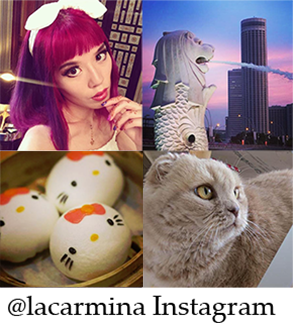 Perhaps you might also plan a future trip to Japan, to coincide with this time of year. If so, it’s best to book and plan early, since plane tickets and hotel rooms are pricy during this high season. But you can still celebrate, no matter where you are. Enjoy the flowers shooting up around you. With the winter waning, it’s a good excuse to pick up lighter pieces for your spring wardrobe, like the Salsit Widow dress. … and when the petals fall. 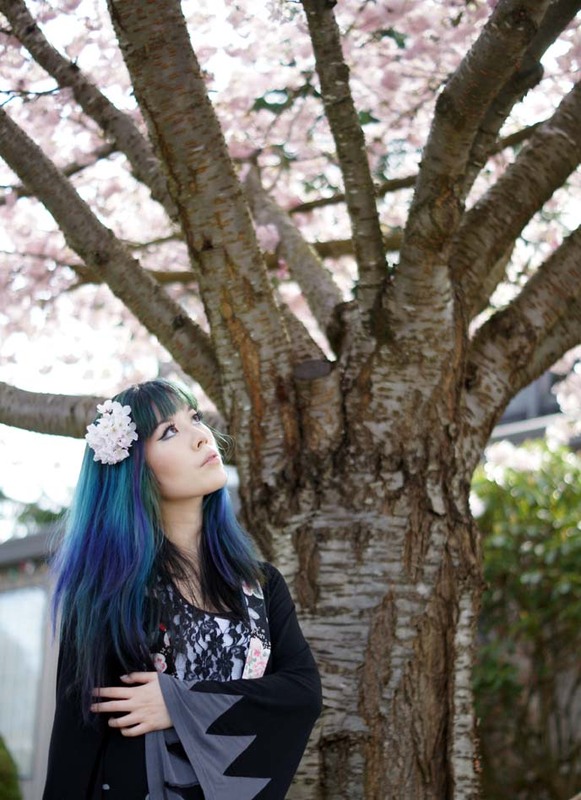 Do you have cherry blossom trees around you? 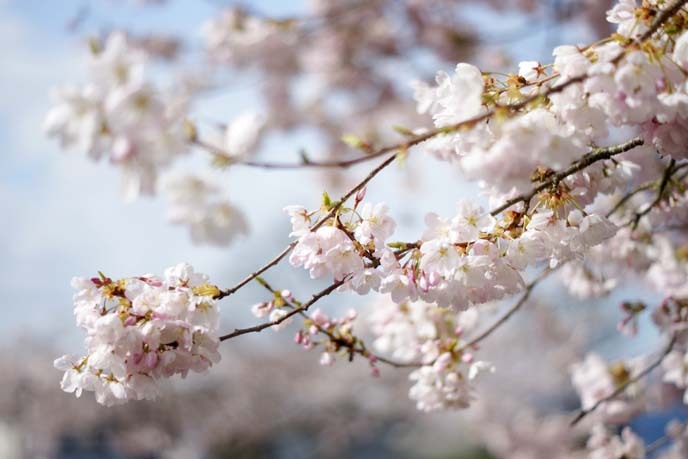 Have you heard of hanami, or tried flower-viewing? stunning photos and love the dress!!!!!! 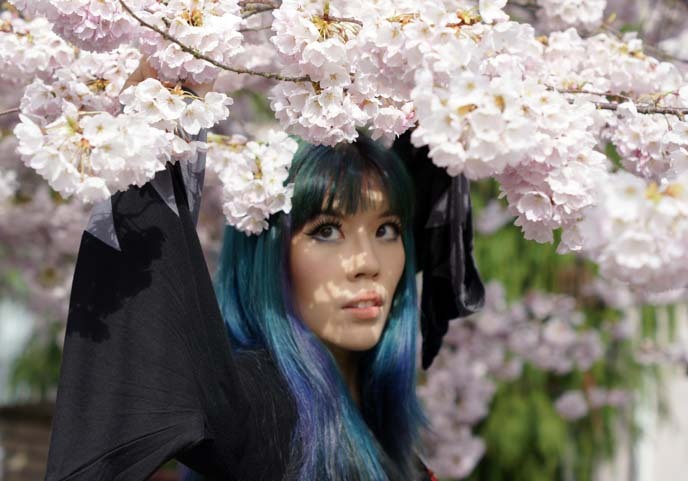 I absolutely adored your Hanami post I hope I get to see Hanami one day. Thank you Sophie! It’s a wonderful occasion. 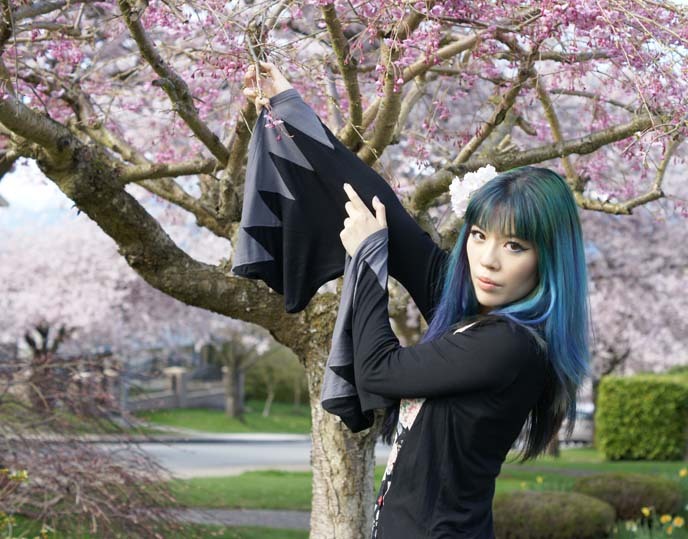 Ah, this makes me miss hanami and just being in a place where cherry blossoms bloom. They made the trip to work so much more enjoyable. I love your ensemble; I think it conveys the ethereal quality of sakura (also I love Gouk so much). I can’t believe the blossoms are already turning brown and falling! Such a brief and lovely time. The site keeps getting better and better. I’ve been reading you for years and it’s nice to see how everything grows. Picture perfect! I so wish I could celebrate with you. Sakura is the most beautiful season in Japan! Wonderful. Here you look like Count D from Pet Shop of Horrors. You have so much grace, very photogenic! Aww that was such a beautiful post in every way! Wow, this is a great post =) The pictures are beautiful. Enjoyed viewing your blog. Thank you! And I enjoyed reading your site – great health tips! This is a delightful set of photos.